I value what little time I am able to get at the convent in Mendham (the home of the Community of St. John Baptist, an Episcopal order of women religious). The sisters are extraordinarily generous with their beautiful grounds and even have been known to let me use my aerial camera there. So much of what I experience on the grounds of the convent is a lesson about the importance of getting a different perspective. If your life is at all like mine, it’s easy to get caught up in the minutiae of things—the sometimes-ugly daily details (grocery shopping, laundry, bill paying or desk-cleaning, diocesan requirements and figuring out the answer to the perpetual ‘where-will-the-money-come-from?’ question) that often require far too much of our attention and sap way too much of our energy. It’s nice to have a place so close by to get a different perspective—literally! I know that the Community has as many property worries as we do—for roughly a dozen nuns they have a lot of buildings and real estate and staff to maintain. But I also know that God provides, and has for that order exactly as long as she has for Redeemer—since 1852 (just as Redeemer was incorporated in Morristown in 1852, the Community of St. John Baptist was founded in England in 1852). When I wander into the cemetery at the convent and see what appear to be some walls in less-than-perfect repair, I know what that burden is like. But I can also get some perspective when I’m there by flying above all of the cracks in the walls with my aerial camera (some call it a drone, but that has too many military implications for me…) and seeing the big picture. From the perspective of someone driving by or even walking in the cemetery, it may not be obvious how it is laid out. But as soon as you see it from the air it becomes obvious—a reminder that a change in perspective is always a good thing! It’s hard to miss a lot of the pain and suffering in our world today. If it’s not ‘big-picture’ issues swirling around our nation—race, immigration, the income gap, climate change—it’s things within the broader church—clergy sexual abuse and misconduct, the split of denominations over issues of sexuality or declining membership. 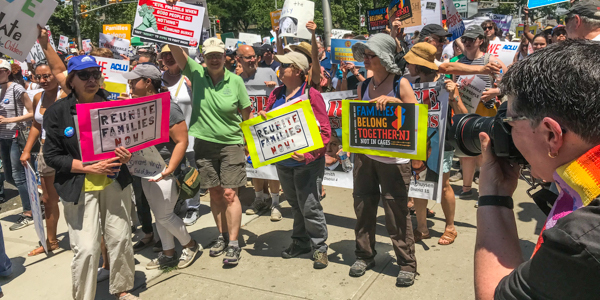 On one of the hottest days of the year, Redeemer showed its compassion once again, this time at the Families Belong Together rally and march in Newark on June 30. It had been a long week. 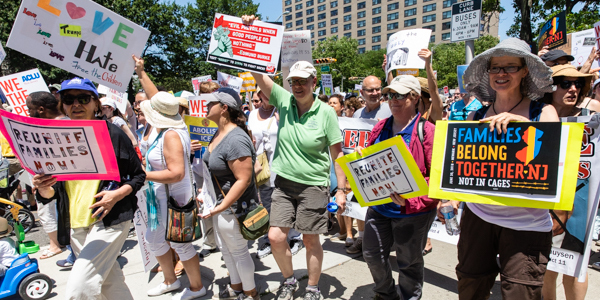 One that started with the Hasker’s funeral, included another horrific shooting (in a newsroom), news that a budget request has been made to build housing on military bases for 12,000 people who cross into the US seeking asylum, and a variety of Supreme Court rulings. The hardest part of that week was the revelation that a Supreme Court justice will soon be appointed. Signs for sale!– We’re glad you’re our neighbor! Signs are available by calling or emailing the church office. They can be picked up on Sunday mornings or during office hours: M-Th, 9-1, W, 9-4. They are $10 each. Language options include: Spanish, French, Swahili, Armenian and Hebrew. All signs have English and Arabic, too.